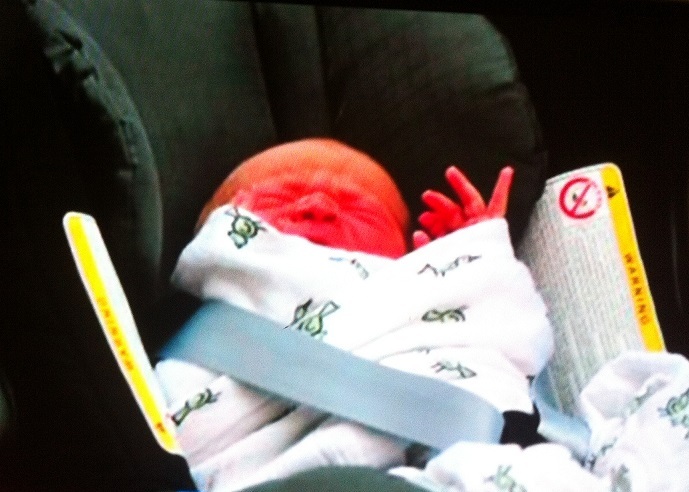 Our first glimpse of the little prince! Seeing Prince William and Kate with their newborn son on the steps of St Mary&apos;s Hospital in London, it&apos;s impossible not to recall Princess Diana striking the same pose with Prince Charles 31 years earlier. Kate appeared on the stairs of the hospital&apos;s Lindo Wing wearing a polka dot dress by designer Jenny Packham. Many have speculated her choice of attire was a tribute to the late Princess Diana, who wore a similar dress for her first public appearance with William. Prince William&apos;s casual look, on the other hand, was in stark contrast to his father&apos;s, who wore a striped suit, tie and pocket square. Diana and Charles posed briefly on the hospital steps before being driven to Kensington Palace via a chauffered station wagon. William, on the other hand, endeared himself to the crowds by loading the baby in the car-seat himself, with mum deciding to sit in the back with bub while dad drove them home. "He&apos;s got a good pair of lungs on him, that&apos;s for sure," William told the crowd before driving away. He also joked about the baby&apos;s hair, saying: "He has way more than me, thank God." "It&apos;s a special time," Kate said. "I think any new parent would know what this feeling feels like." Diana&apos;s brother Charles Spencer has also recalled that her own birth in July 1961 was strikingly similar. He told Us Weekly in a statement: "My father [John Spencer, 8th Earl Spencer] always told us how Diana was born on just such a blisteringly hot day, at Sandringham, in July 1961." Now that the Duke and Duchess of Cambridge are parents, he says, "It&apos;s another very happy summer&apos;s day, half a century on." The palace has indicated that official photographs of Kate, Prince William and the baby will be taken within the next few weeks and be released to the media. Multi-gun salutes will be held today to mark the birth of the new royal heir. The King&apos;s Troop Royal Horse Artillery in Green Park is expected to release 41 rounds, while the Honorable Artillery Company at the Tower of London will sound 62 rounds. There has been much speculation about when the new prince’s name will be made public. Prince William&apos;s name was announced a few days after birth, while his brother Harry&apos;s was announced on his departure from hospital. Bookmakers Ladbrokes has James as favourite for the new prince, followed by Henry and George, Philip, Alexander and Richard. Prince William is expected to take two weeks&apos; paid paternity leave before returning to work as a RAF pilot. It’s not known where the family will spend their first precious weeks, but eventually they will live at Kensington Palace, where a new apartment is being refitted for them. The couple intend on giving their baby as normal an upbringing as possible, and are reportedly not planning to employ a full-time nanny. Congratulations again to the happy parents. 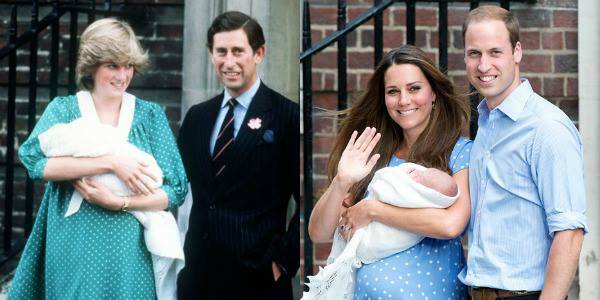 For a complete Royal Baby round-up, click here.